Sure you can encrypt it but you could also choose a physical protection. 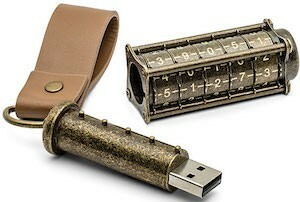 Now there is this cryptex flash drive that has a 5 number combination to get the USB drive out of the metal cylinder. Inspired by sketched that DaVinci made this cryptex will protect your data from being seen by the wrong people. The USB flash drive has a steampunk like design and has 16GB of storage space so that all your important data can be securely stored on it. Why risk you data from being stolen why you can easily secure it with this Cryptex Steampunk USB Flash Drive.